Use the amazing power of static electricity! The level of polish is insane. Awesome job! My favorite chiptune music. My Favorite pixel art. Simple, yet very creative. Super hard too. One thing I wonder is what the thing I'm controlling is. The downloads are somewhat confusing with jam version and improved one. Thanks for the feedback! 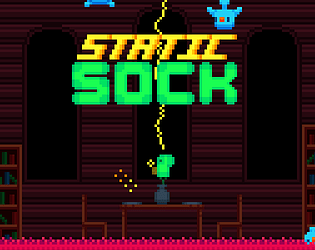 As the page/title says, you play as a sock. I feel that the download complications are a necassary evil for now, but once the jam's over I can remove the original version. One thing I'd suggest though; consider adding "c" in addition to "z" for jumping, as it would allow the player an easy way of choosing which finger (middle/index) to assign to which action (jump/zap). Thanks for the feedback! I was wondering why some games had C do the same thing as Z - makes sense now. If I do a post-jam version then I'll probably implement controls remapping so you can do that as well as play with a different keyboard layout. Wow, this game is hard! I kept hitting "z" to zap only to find myself jumping when I wanted to zap 'em. I would consider making the lightning hitbox larger, but maybe that's just because I'm not very good at it ;D. Very nice game all around. Thanks for the feedback! The lightning hitbox is already way larger than you probably think it is, much larger than the visuals make it seem, so I think that making it any bigger would make the game too easy. On the topic of difficulty, I think I need to start making my games less difficult, as I'm mostly designing them to be played by myself rather than new players due to being kind of the only playtester. Not sure about the controls thing though - have you been playing another game where Z is attack? That happens to me sometimes. Oh gosh, I guess I'm just bad then xD I don't know if I've played any other games with z as attack, but I just continuously died because of that lol. Also nothing wrong with making a difficult game! Keep it up man. This is brilliant! Short, cute, and very polished! I can't get over how clever the concept is, and how well you executed it!